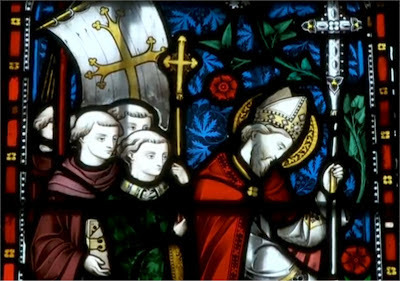 St Anthony Communications have produced a short film about St Augustine of Canterbury. It is well arranged in the style of modern historical documentaries: walking across windswept landscapes while shouting to camera, that sort of thing; and makes important points about English history while showing where it all started. Fr Marcus Holden, the parish priest of Ramsgate which includes in its boundaries the place where Saint Augustine landed, narrates the arrival of St Augustine, the conversion of King Ethelbert, the origin of Canterbury Cathedral and the destruction wrought by King Henry VIII. We also hear of the revival initiated by Augustus Welby Pugin who built the Church of St Augustine's, Ramsgate, now a national shrine. A generally ignored aspect of the Rochdale case is the damage caused by our society's current focus on giving "sexual health advice" to the detriment of the safety of children under the age of consent. 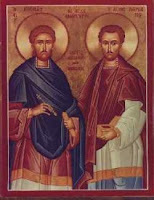 In God’s providence, the day for our Mass for the Knights of St Columba chain of Prayer is the feast of Saints Cosmas and Damian. They are the patron saints of doctors, who are also involved with promoting the sanctity of human life so ask them this evening to divert their prayers also to politicians for whom we are praying. The Blessed John Henry Newman Institute of Liturgical Music had their conference last weekend and a jolly good conference was too by all reports. You can read one report at Bara Brith and another at St Mary Magdalen Choir, Brighton. Apparently one of the speakers asked "When did you last hear an introit?" 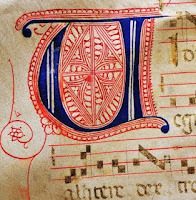 At most Liturgical music days you could expect a proportion of the audience to ask "What is an introit?" At the JHNILM day there was a less common response with several of the audience mouthing to each other "last Sunday." At Blackfen, I'm proud to say, you could hear two sung introits on any given Sunday, one at the English sung Mass and one at the usus antiquior. We start the Mass as we mean to go on. Bara Brith has launched from this question into a heartfelt and strongly expressed article (I did not say rant) on the whole question of hymns and actually singing the texts of the Mass. Most enjoyable. 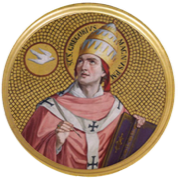 Please pray for me to the Lord Jesus, whose Heart yearns for us in the Blessed Sacrament, that I might be a humble and holy, orthodox, creative and courageous, Bishop of Portsmouth, one fashioned after the Lord's own. I understand that at Bishop Egan's request, there was an hour of adoration concluding with Benediction for the famiglia at Archbishop's House the evening before the ceremony. The bunfight after the ceremony itself was cut short by the celebration of sung Vespers in the Cathedral after which Bishop Egan consecrated himself and his diocese to the Sacred Heart. Please join your prayers to Bishop Egan's. "I want to be a courageous orthodox bishop"
In the booklet for the Mass at Portsmouth today, at which Philip Egan was consecrated eighth Bishop of Portsmouth, there is an introduction by Bishop Egan (a musically educated man himself) explaining, among other things, the choice of music for the Mass. There were some "old favourite" Catholic hymns at appropriate points (O purest of creatures, Soul of my Saviour, Sweet Sacrament Divine) and some elements from "A Community Mass" by Richard Proulx, as well as Gregorian chant. It was good to see that after various motets, songs, organ pieces and the hymn Praise to the Holiest, which were sung before Mass, the introit Salve Sancta Parens was sung while the altar was incensed. Also from the (modern) gradual was the Alleluia and verse. Along with probably millions of others I just loaded The Hobbit onto my Kindle (not sure what J R R Tolkien would think of that) and it is my bedtime reading. I'm trying to limit myself to a chapter a day because I read too quickly and want to chew it over. There are many devotees of Tolkien who will, no doubt, be disappointed by the film because of inaccuracies and omissions that are inevitable in transferring a book to the screen, especially one like this. Although it may make me a philistine among keen Hobbit fans, I am looking forward to the film. Unfortunately the release date seems to be 14 December in the UK which means that I will have to be quick off the mark to book a seat at Bluewater after the opening rush and before the schools break up. Our Parish patronal feast day at Blackfen is the Feast of Our Lady of the Rosary, 7 October which falls on a Sunday this year. At the 10.30am Mass, the group Cantores Missae, a consort group of singers comprising some of the UK’s leading soloists will be singing for this Mass which will be a High Mass with Fr James Bradley of the Ordinariate of Our Lady of Walsingham as celebrant and preacher, Fr Bernard McNally as Deacon and Fr Timothy Finigan (parish priest) as Subdeacon. Strawberry Hill - shaken or stirred? News has emerged that Professor Eamon Duffy has resigned as an honorary fellow of St Mary's University College, Twickenham, as has Dr Robin Gibbons, a long-serving theology lecturer. Professor Gavin D'Costa has withdrawn as a keynote speaker at a theological conference planned by SMUC. All three cited the proposed merger of the School of Theology, Philosophy and History, and the School of Communication, Culture and Creative Arts, into a school of Arts and Humanities, as the reason for their action. Professor Duffy spoke of the recent incident in which Dr Towey was escorted from the building by security as showing that things had gone badly amiss with the Christian and Catholic ethos of St Mary’s. At an academic board meeting recently, a motion of no confidence in the Principal was proposed - but ruled out of order by the Principal. Popish nick-nackets or icon of freedom? Some would see this as an example of how things can be better with less regulation and government interference. Not sure how well the abolition of traffic lights would work in some parts of London but perhaps that is too sceptical. The students at Strawberry Hill are not behaving themselves. Don't they realise that the security staff have enough to do escorting lecturers off the premises without having to chase around removing unauthorised posters. Young people nowadays! Tsk! 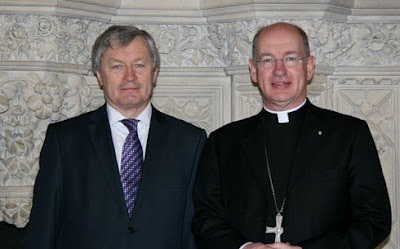 Fr Richard Whinder has written today to tell members of the Confraternity of Catholic Clergy that Father Stephen Langridge, Chairman of the Vocations Directors of England and Wales, will make a brief presentation on Tuesday evening, adding to the outstanding line-up of speakers. As Fr Whinder says, Fr Langridge is currently setting up the first dedicated centre for nourishing a culture of discipleship and vocations promotion at Whitstable in Kent, building on his successful work as Vocations Director for the Archdiocese of Southwark. This is one of the many positive moves which are taking place in the Church today, 'faithful to the inspirations, initiatives and example of the Holy Father', which is among the objects of the Confraternity. The other day I linked to the funny blog Eccles and Bosco is saved. 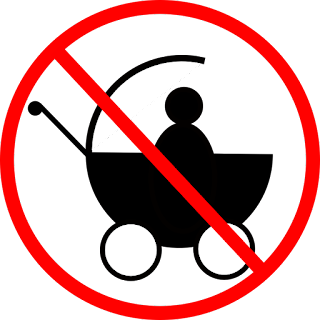 I had a troubled email about it from a priest who had followed a link on the sidebar, and several others were a bit iffy. During the blognic at the Coal Hole last night, after saying goodbye to a friendly journalist from the Economist who wanted to talk to myself and Fr Z about the growing popularity of the usus antiquior, I suggested that Dillydaydream, the highly proficient commenter and internet sleuth, would be able to shed light on the matter of Eccles and Bosco if we could contact her some time. Shortly afterwards, she walked into the pub, generously shared a bottle of red wine (for those not drinking Brains) and explained everything. You can never predict what is going to happen at a Catholic blognic. St Mary's University College, Twickenham, often still known by the delightful name of its more specific location of Strawberry Hill, but nowadays more often by its ugly new acronym SMUC, took the decision over the summer holidays to merge the School of Theology, Philosophy and History and the School of Communication, Culture and Creative Arts into a new School of Arts and Humanities. This rather left Anthony Towey, the head of Theology, Philosophy and History in limbo and I was wondering how things might develop. EF Pastor Emeritus wrote this morning of the astonishing news that Dr Towey was escorted off the premises by security in the middle of a lecture he was giving on Christology. (I wonder if he had got as far as the Latrocinium?) This news has now also been published by ICN. There is a meeting of the College's Board of Governors on Thursday. Fr Z has mentioned that I am celebrating the Mass tonight at Corpus Christi, Maiden Lane (6.30pm.) Afterwards, we usually gather in the Coal Hole on the Strand so, as Fr Z puts it, we can have an extemp blognic. 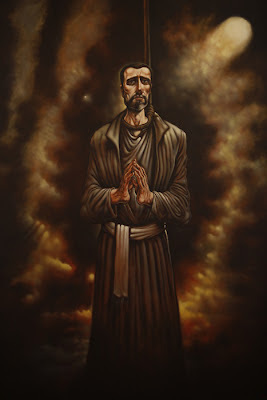 Dylan's report on the third meeting of the Guild of Blessed Titus Brandsma includes a summary of the talk given by Fr Rupert McHardy of the London Oratory. I was sorry to have missed this (parish schedule) but glad to read some of the points that he made. Thanks to Bara Brith, I have discovered Eccles and Bosco is saved which is quite funny if a bit edgy. It is now on the blogroll. It really doesn't feel like five years since the implementation of Summorum Pontificum. It must be my age. Last night at Blackfen we had Missa Cantata for the Sodality of the Five Holy Wounds with the sublime Byrd three part Mass sung by three people. Mass was followed by the En ego, the daily prayer of the Sodality, and the Te Deum in thanksgiving for Summorum Pontificum. A shared supper convivium rounded things off nicely. My contribution was a couple of bottles of shampoo. People sometimes give me bottles of this stuff (always appreciated) and I save it for a suitable occasion - such as this anniversary. 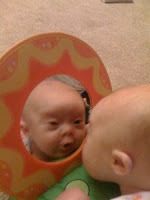 Cassie Fiano at PJ Lifestyle gives 9 Reasons Down Syndrome Won’t Ruin Your Life. This is a great post in which Cassie admits with humility and honesty the uncertainties that she had, uncertainties that might be shared by many mothers. Coming straight from the heart, this would be a good post to keep bookmarked somewhere for when you meet someone who is worried about having a Downs syndrome child, especially if they are under pressure to "terminate" that child's life. 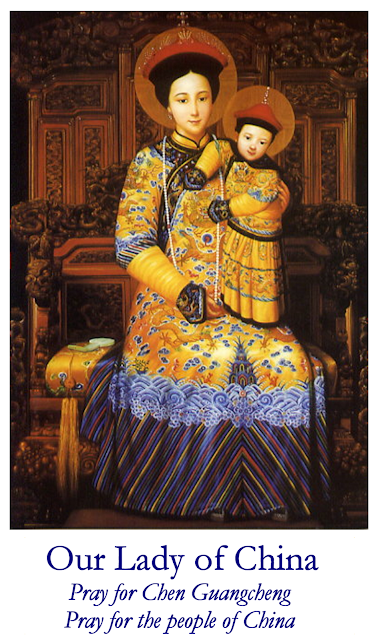 Chen Guangcheng is a name familiar to regular readers of this blog since 2006. Usually described in the secular media as a human rights activist, his activism has been particularly focussed on forced abortion and sterilisation as a result of China's one child policy. After dramatically taking refuge in the US embassy earlier this year, Chen was offered a fellowship to study at New York University. From the US he is now appealing to Apple to exercise social responsibility, as LifeSite News reports. Chen and others want to meet with Apple CEO Tim Cook to ask him to prohibit access to factories for government family-planning officials and to refuse to report women who are pregnant without birth permits. With the condescending proposal of Melinda Gates to flood Africa with condoms still causing reaction this would be a good opportunity for Apple to show how large corporations could do some good in the realm of social justice. Joe at Catholic Commentary has kindly posted a considered response to my paper on New Movements and New Media. Joe has a comprehensive and sympathetic knowledge of new movements and his comments are well worth reading. My half-hearted assertion that the Catholic blogosphere was a special case of new movement is certainly open to criticism. However I'm not sure that the Catholic blogosphere could be described as a "party" in Newman's sense either. While it is true that many Catholic blogs do assume that the Extraordinary Form is "the only show in town" there are plenty which do not. The rich variety of Catholic blogging defies either my attempt to shoehorn it into the category of new movement or the description of it as a party. New movements John Paul II, new media Benedict XVI: discuss. Here is a link to the talk that I gave this morning at the conference of the Catholic Theological Association of Great Britain here in Durham: New Movements and New Media. I am probably going to regret making the generalisation which I used to try to give some structure to the talk since it can be shot down easily. We had half an hour for questions and discussion which proved challenging and thought-provoking. Putting it tactfully without using labels, CTA members are drawn from a wide range of theological viewpoints so there was some disagreement about some of the major points of the talk. Since some questions were raised that deserve a more considered answer, I have made some notes so that they can be raised here in due course. One not to miss. Obianuju Ekeocha Is working as a biomedical scientist in Canterbury. Most of her family are in Nigeria. She has written an open letter to Melinda Gates in response to her plan to inject 4.6 billion dollars' worth of contraception into her homeland. The letter was published at Catholic Online but I link to it at Little Catholic Bubble which is where I found it. ... and very nice countryside too. I am on my way to Durham for the annual conference of the Catholic Theological Association. Tomorrow morning I am to speak on the subject of new movements and new media. These are difficult subjects to merge. I'm going to say that new movements flourished especially under Blessed Pope John Paul and blogging under Pope Benedict. If that generalisation doesn't get you too hot under the collar, I'm going to suggest that the blogosphere is a special kind of "new movement." Not sure whether it will be safe for me at Saturday's blognic after saying that! It is a gloriously sunny day so I hope that the weather holds for tomorrow afternoon when I should have time to take some photos of the Castle, the Cathedral and suchlike. The Sodality of the Five Holy Wounds will have Missa Cantata this Friday 14 September at Our Lady of the Rosary, Blackfen at 8pm. It is the feast of the Exaltation of the Holy Cross and the fifth anniversary of Summorum Pontificum. The Mass will be followed by a shared supper which means that you are supposed to bring some food if you want to join in that bit. Remember that it is a Friday, so no meat. I have had an enormous number of messages of appreciation of Fr Hugh Thwaites in the last week; he has touched the lives of many… through his example, his preaching, his presence and his cheerfulness. Hopefully now he will continue to touch even more lives through his prayers. 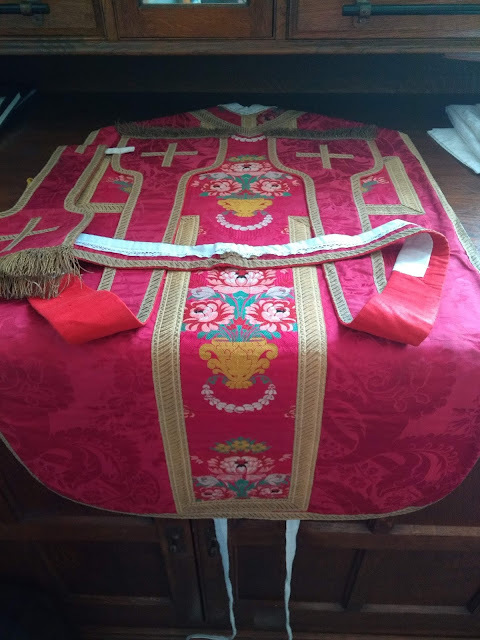 We had the requiem Mass at the Jesuit parish in Boscombe, on the south coast on Friday last week, with the burial of his mortal remains in the Jesuit portion of the graveyard. 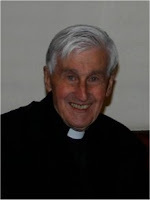 There will be a Memorial Mass in the Extraordinary Form for him, celebrated by Fr John Edwards SJ, at 2.00 pm on Tuesday 11th September at Farm Street Church. Blessings and prayers to you and all your families. Catholics in Cornwall have responded with imagination to the Government's new provision for "Free Schools", that is, schools which are fully-funded by the Government but not under Local Authority Control. St Michael's in Camborne has just opened, with a capacity of 300, making it a small secondary school capable of maintaining small class sizes and giving close attention to children. Naturally, various branches of the anti-Catholic brigade have taken a dislike to the idea. Some activists in one of the teaching unions have got upset, the Humanists are obviously foaming at the mouth, and the militant gay lobby were given a bit of a gift by some intemperate remarks by a grandparent at a recent meeting. Hence there was a protest today outside the school at which a whole twelve people turned up. The forthcoming Colloquium of the British Province of the Confraternity of Catholic Clergy will take place from 23-24 October. I mentioned before that my good friend Bishop Philip Egan will be there. He is celebrating Mass on the first day and preaching. The talk on the first evening will be given by Fr Uwe Michael Lang, on the subject of the 50th anniversary of Sacrosanctum Concilium, "Towards a New Liturgical Movement"
Finally, Fr Andrew Pinsent, Research Director of the Ian Ramsey Centre for Religion and Science at Oxford University will be speaking on "Science, Grace and Catholic Enlightenment." It is important that the world knows about the persecution of Christians in Pakistan. Atrocities are happening regularly as can be seen at the blog Friends of the Oppressed. There is also fresh news on a daily basis at the British Pakistani Christian Association blog. Recent events in the case of Rimsha Masih seem to show that the Pakistani government will respond in some way (though by no means adequately) to pressure from international expressions of disgust at these outrages, and I believe that bloggers can play their part in publicising them. Do take a look at the blogs linked above and add your own voice to those exposing the gross and violent oppression of the innocent.